As was true for Brazil previously, reports about surveillance aimed at leaders are receiving most of the media attention, but what really originally drove the story there were revelations that the NSA is bulk-spying on millions and millions of innocent citizens in all of those nations. The favorite cry of US government apologists -- everyone spies! -- falls impotent in the face of this sort of ubiquitous, suspicionless spying that is the sole province of the US and its four English-speaking surveillance allies (the UK, Canada, Australia and New Zealand). ... First, note how leaders such as Chancellor Angela Merkel reacted with basic indifference when it was revealed months ago that the NSA was bulk-spying on all German citizens, but suddenly found her indignation only when it turned out that she personally was also targeted. That reaction gives potent insight into the true mindset of many western leaders. ... Second, all of these governments keep saying how newsworthy these revelations are, how profound are the violations they expose, how happy they are to learn of all this, how devoted they are to reform. If that's true, why are they allowing the person who enabled all these disclosures -- Edward Snowden -- to be targeted for persecution by the US government for the "crime" of blowing the whistle on all of this? If the German and French governments -- and the German and French people -- are so pleased to learn of how their privacy is being systematically assaulted by a foreign power over which they exert no influence, shouldn't they be offering asylum to the person who exposed it all, rather than ignoring or rejecting his pleas to have his basic political rights protected, and thus leaving him vulnerable to being imprisoned for decades by the US government? ... Third, is there any doubt at all that the US government repeatedly tried to mislead the world when insisting that this system of suspicionless surveillance was motivated by an attempt to protect Americans from The Terrorists(TM)? Our reporting has revealed spying on conferences designed to negotiate economic agreements, the Organization of American States, oil companies, ministries that oversee mines and energy resources, the democratically elected leaders of allied states, and entire populations in those states. 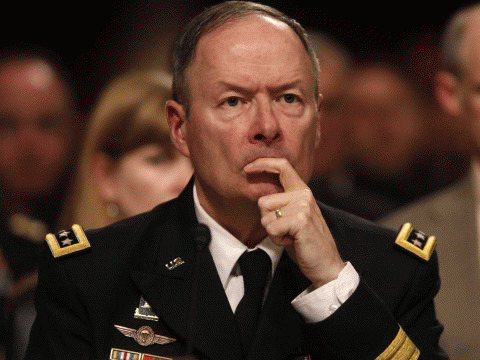 "The head of the embattled National Security Agency, Gen Keith Alexander, is accusing journalists of 'selling' his agency's documents and is calling for an end to the steady stream of public disclosures of secrets snatched by former contractor Edward Snowden. "'I think it's wrong that that newspaper reporters have all these documents, the 50,000 -- whatever they have and are selling them and giving them out as if these -- you know it just doesn't make sense,' Alexander said in an interview with the Defense Department's 'Armed With Science' blog. There are 25,000 employees of the NSA (and many tens of thousands more who work for private contracts assigned to the agency). Maybe one of them can tell The General about this thing called "the first amendment." I'd love to know what ways, specifically, General Alexander has in mind for empowering the US government to "come up with a way of stopping" the journalism on this story. Whatever ways those might be, they are deeply hostile to the US constitution -- obviously. What kind of person wants the government to forcibly shut down reporting by the press?